Famous quote: "I don't intend to kill you, Shirou. You're mine. I'll kill the other Masters, but you're special. That's why I locked you up here, so there won't be any interruptions." A young Teutonic aristocrat, she traveled to Japan to participate in the Holy Grail War as a Master. Illyasviel has an angelic appearance and an unsurpassed degree of magical power. She lives in a castle on the outskirts of Fuyuki City, accompanied only by her Servant and two maids. Illyasviel asks those she feels comfortable around to simply call her "Illya." Her servant, Berserker, is the legendary Greek hero Heracles. This, along with her aristocratic upbringing, give her a sort of arrogant attitude, especially during battles. She develops an attachment to Shirou early in the Grail War, calling him "Big Brother," and offering to spare him in exchange for serving her. After Berserker is defeated by Saber and Shirou, Illya comes to live with Shirou at his home. Taiga becomes a sort of big sister to Illya, taking care of her whenever Shirou is away, even after the Grail War ends. In Fate/Zero, it is revealed that Kiritsugu Emiya is Illyasviel's father. She has been killed violently by Gilgamesh in order to complete the Holy Grail ritual. 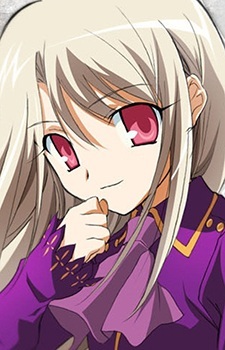 Illyasviel von Einzbern is an ordinary elementary school student who becomes a magical girl when the magical Kaleidostick Ruby deems her a more suitable master than the sorceress, Rin Toosaka. Rin, who had been tasked by the wizard Zelretch to collect the seven Class Cards containing the spirits of Heroic Spirits from legend, finds that she is unable to change Ruby's mind and must supervise Illya in completing the task of collecting the Class Cards.